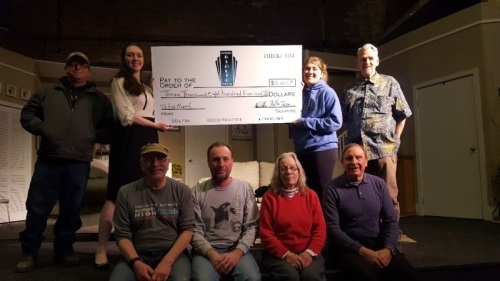 A donation of $3,805 was recently presented to the Rialto by the Florence High School (FHS) students who wrote, directed, produced and acted in “Twelve Too Many”, a three-show dinner theater at FHS in January. All profits from the play were donated to the Rialto. Seniors LaNae Terrian wrote the play and Talia Smith directed the play. The big check was presented on the set of “Exit Laughing” to representatives of the Rialto Board Directors. In the back row and left to right are Ken Trusty, Smith, Terrian, and R.C. Wilkins. In the front row are Ron Hinkle, Todd Williams, Donna Murphy and Steve Steele. Board representatives not present were Larry Baker, Marty Burleson and Kathy Seidling. A special thanks to all members of the production crew, cast and family members of “Twelve Too Many”!! !